Chicken breast may be the quintessential bodybuilding staple, but lean cuts of red meat are loaded with complete protein and pack the most punch when you're trying to pack more beef on your frame. Buy It: Always purchase London broil that's bright-red in color. If it has even the lightest tint of brown to it, it has started to spoil. Try to find a steak or roast that's at least 1 inch thick with as little visible fat as possible. Prepare It: Preheat a grill to the highest heat setting. 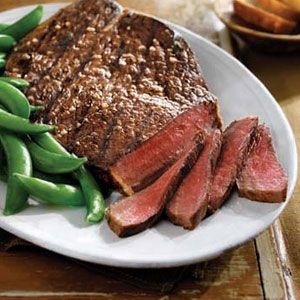 Remove all visible fat and cut the steak or roast into 4-6-ounce individual steaks. Season both sides of meat with salt, pepper and/or a spice rub or marinade. Place on grill and cook 3-6 minutes per side or until cooked to your liking.